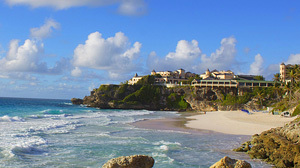 The Crane Hotel sits atop the a bluff on the south coast of Barbados overlooking Crane Beach. Built in 1887, the Crane Hotel is one of the oldest hotels in the Caribbean. The eastern Caribbean nation of Barbados is an island about three times the size of Washington, D.C. and has a population of approximately 280,000 people. Barbados, the eastern most of the Caribbean islands, features all you would expect of a tropical paradise: beautiful beaches, crystal-clear water, and impossibly hospitable people. "People come here and enjoy the flying fish, and enjoy the rum and all of our beaches and go sightseeing," said Averill Byer, Director of Marketing for the Barbados Tourism Authority. "But at the end of the day, it really is the people that makes them come back." With an average daytime high temperature of 78 degrees it's easy to see why Barbadians, or Bajans, as they are often called locally, are so welcoming. "I wake up every morning having the best time of my life because Barbados is definitely one of the most beautiful destinations in the world," said Byer. The small island of 166 square miles is about three times the size of Washington, D.C. and has a population of approximately 280,000 people. Barbados was a protectorate of the United Kingdom until it gained its independence in 1966. Barbados is also birthplace of the pop star Rihanna, the home of Mount Gay Rum, and the location for Tiger Woods' wedding to Elin Nordegren in 2004. Often a playground for the rich and famous, Barbados' white sand beaches are recognized as some of the best in the world. Crane Beach, near the historic Crane Beach Hotel on the south coast, has been labeled one of the world's sexiest beaches. All of Barbados' 70 square miles of beaches are open to the public by law. "Barbados is an island that is basically coral so that allows us to have that fine powdery sort of sand on our beaches" said Byer. The beaches of the southern and western shores of the island are classic tropical white sand beaches, while the more rugged East coast features a sharp contrast. Jagged rocks accent the Atlantic Ocean side of the island providing a dramatic, picturesque landscape. As the eastern most islands in the Caribbean chain, Barbados's sees some of the largest waves in the region. Near the fishing village of Bathsheba, an area called the "Soup Bowl" attracts surfers from around the world for international competitions. "Barbados is the best island for surfing because we have waves about 360 days a year and the water is always warm," said Melanie Pritcher, surf instructor and owner of Barbados Surf trips. "You hear about Hawaii other big places -- Tahiti, and things like that -- and Barbados is not mentioned that much, but it's becoming more popular," said Pritcher. Born in Barbados, Pritcher moved to Miami at the age of six, but decided to return to her native island in her early 20s. "I came back to Barbados so that I could surf every day, or almost every day, and to enjoy the island life." Said Pritcher. The relaxed atmosphere -- the laid back life. It's a healthy life. You know, I don't go shopping, I go surfing. Away from the surf, in the hills of central Barbados, Anthony Hunte finds bliss in his garden. "I'm up every morning about 4:00 a.m., 4:30 a.m. And you hear the birds starting to sing and the whistling frogs, which are tiny little frogs," said Hunte. "You see all the little hummingbirds and they start as soon as the first light is there. Because you know the early bird gets the worm. It's just a total feeling of peace. Opened for business five years ago, Hunte's Garden is one of many tropical gardens in St Joseph's Parish. The plant friendly climate makes the area a gardener's dream. "This is truly a tropical island. So we do get little drizzles and rain, but what's really nice is the sun comes up right after and it's always marvelous," said Hunte.